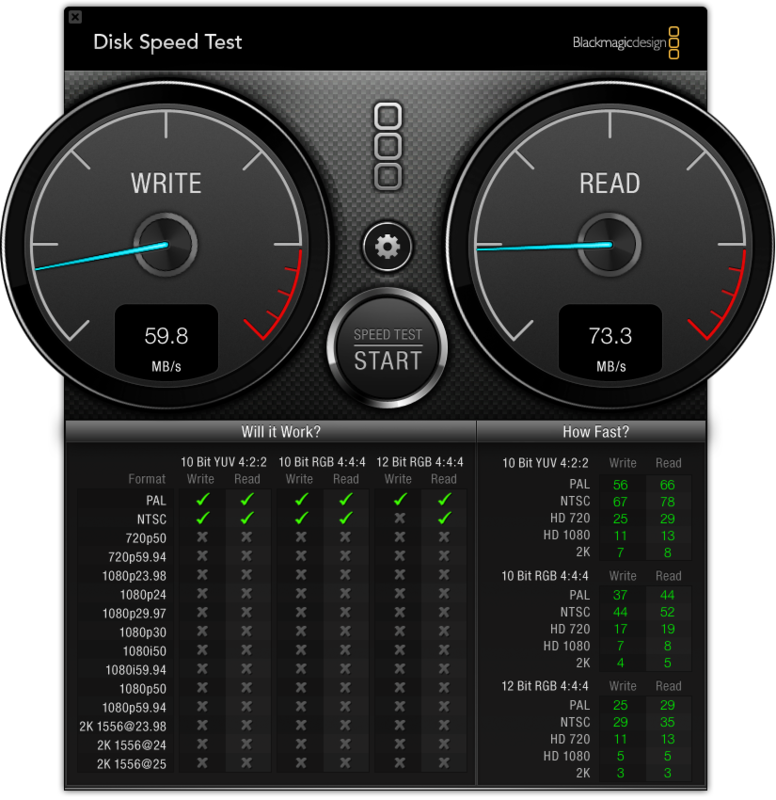 I came across this free app on the apple app store, and found it was very useful in testing your disk speed for video. It lets you select any drive volume for testing... whether it's a single disk, or RAID. It will run read and write tests, and give you a result in MB/s. Not only does it give quick and simple results, but it tells you exactly what formats your drive can handle... from standard NTSC to 2k... from 10bit 4:2:2 to 12bit 4:4:4. It will also tell you the max frame rates your drive can handle. I can't even say if they released this for Windows... try searching for it. If not, maybe there's a different one for Win users? Nice speeds! What sort of RAID setup do you have? Actually, my RAID is internal in my Mac pro. I modified my system to take 7 hard drives by removing the optical drives. So I have a 6-drive RAID 0 (using Seagate 500gb 7200.12 drives).... and the 7th drive is my system disk. The raid is just running from the internal SATA connections in the Mac Pro (no special card)... and configured with Apple's RAID utility. Very simple, very cheap, VERY fast! Brave man. Aren't you afraid of data loss with the lack of redundancy? Only takes one of those drives to fail for the whole array to go kaput! Fast but dangerous. I would use at least raid 3 or raid 5. Also i would use SCSI drives in raid configuration. 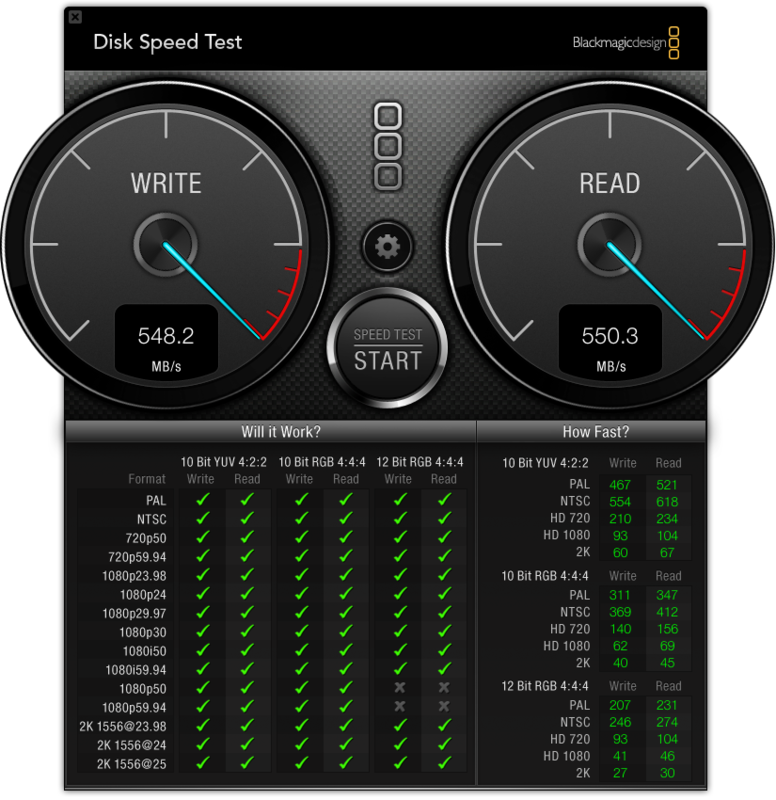 As long as you are using sata drives you start to loos preformance when drives start to come more populated. I always have 2x 2TB backups of my RAID on external drives so if there is a failure, as long as I back up every day, I'll never loose more than a day's work (theoretically). Haven't had a problem with this setup YET : ). Didn't look into SCSI much.... have to buy a card, and more expensive drives. In the future, it would be really nice to have a SSD SATA RAID.... too expensive now, but in the future that would be blazing fast and very reliable too. Works fine on PC. Free download from the Black Magic site. couldn't find it on the site-care to share a URL? ?